Why aren't there more single rotor drones out there? I have just recently joined this forum and find it fantastic what you guys are doing, very nice job. There is one question going around in my mind for quite a while now: Why aren't there more single rotor drones out there? Though some posts here touch on that topic, I could not find any post discussing this matter in more detail. There is probably no better place to get some informed opinions on this than this forum here, so I would love to hear your take from any possible perspective you might offer. In my mind there are many points speaking for a single rotor design. Though its implementation might be more difficult. A single rotor drone could be designed to be a lot more energy efficient than a multi-rotor design, resulting in longer battery life. It could also be designed for higher payload and high-altitude capabilities (e.g. high-payload in mountains etc.). In addition to that they could offer higher flight stability, increasing their application potential in strong winds (e.g. inspection of wind turbines). So, what do you think is the reason why there aren't more single rotors out there? You're certainly right about the single rotor in that you get better efficiency and inherent stability. I think it really comes down to mechanical simplicity. I've been involved with UAVs for around 20-years now and have worked on single rotor, coaxial twin-rotors, dual shrouded rotor and upper-surface-blowing designs. These typically need swash-plates, control-vanes or some other means for stability and control. It's perhaps a little bit ironic that although it's inherently unstable, the quad is one of the easiest configurations to stabilise and control now the autopilots have become so good. You don't have to worry to much about the aerodynamics mechanical arrangement just to get the thing in the air so a lot more effort can be put into the other aspects that differentiate the different designs. An obvious example of particularly successful single rotor design is the Yamaha R-Max that has been around since 1990s. It has all the advantages that you mention. Many thanks for your reply Sam. I am still somewhat surprised though. It appears as if most drone applications today and in the future would benefit from the advantages of a properly integrated single rotor design. Though controls would be possibly more complicated. As you mentioned, it really seems to be a problem of mechanical complexity and as a result, cost. However, in my opinion it should be possible to maximize the benefits of such a design and drive down the cost by an intelligent design that properly integrates engine, airframe and controls. Nevertheless, even given the amount of additional complexity for a single rotor, having to pay $100 000 to $1 000 000 for a UAV like the R-Max just doesn't seem to be justifiable to me for most applications. At the end of the day the question seems to be whether one could drive down the complexity and cost of a single rotor drone (and perhaps make it aesthetically more appealing than a helicopter UAV :-D ) in order to enable their potential for a wider range of applications. Would you see it the same way? There is only so far you can reduced the complexity of a single rotor aircraft and suspect that a quad will always have the advantage is this respect. As far as I know, most of the interest in military UAVs and developments from the big aerospace companies have not been on quads for the reasons you suggest. 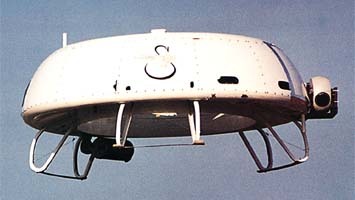 I myself think there is a lot of potential for a single shrouded rotor system like on the Sikorsky Cyher. Although the shrouded rotor can be made more efficient than an open rotor in a static thrust comparison, there is now the added aerodynamic complexity to worry about that only gets worse as you move to horizontal flight. The quad is nothing like optimum and there are lots of people working on what appear to be better arrangements. However, as I mentioned in my first post, the reality is that now the flight controllers are so incredibly good, quads are just the easiest solution. I don't see their prevalence changing in the immediate future. History teaches us with many examples that it is not always the "best" technology that wins. I think there will be a shift to single rotor sUAS in the near future as more and more people start using drones for commerical use and need longer flight times and greater payload while in use. Multirotors have advantages as well, and I believe that for a small platform (under 2kg) with a stabilized small camera on it, they are best. However, for heavier payloads and 1 hour+ flight time a helicopter is far superior for stability, efficiency, payload capability, portability, safety, etc. You can still find buried in the complete index of the ArduPilot Wiki the designs for single rotor and Coaxial (dual rotor) designs using conventional propellers. They have some overriding severe limitations. They require servo driven vanes in order to accomplish movement and in the case of single rotor also to counter reverse spin. Worse, all the designs so far are very low performance and perform very badly in any kind of gusty or windy environment. And that doesn't seem soluble. The Heleicopter which is technically a 2 rotor design (one big and one little) is capable of realizing both high performance and the extra efficiency possible with one large rotor as opposed to a bunch of small ones. Of course this comes at the expense of having a complex rotor pitch compensating mechanism that actually adjusts the rotor through various pitches on each rotation. Nonetheless, the conventional helicopter emphatically DOES have considerable potential in the UAS world. Robert Lefebvre is DIYDrones Helicopter Guru and has contributed our helicopter operating firmware as well as much information on the subject. Fixed pitch single or coaxial designs will only have very limited applications due to the problems and limitations mentioned, but for helis, the sky really is the limit. Many thanks for your replies Sam, Jason and Gary.Very interesting points. From a strictly physical point of view I see many advantages coming from a single rotor design that just can never be met with a multi-rotor design - and I'm more thinking about commercial applications indeed. The current developments in drones might actually open up new possibilities to design stable single rotors - in the end changing the pitch is only one possible approach to changing the lift of a rotating airfoil. The large scale of the potential drone market might actually allow us to think completely out of the box and come up with much better solutions to the problem than simply adopting a helicopter design. In this, I see a big chance for advancement in the field and for a leap in performance - in terms of battery life, energy efficiency, stability, noise and other performance factors. Another argument explaining the low use of helicopter or single rotor drones is their dangerousity. The long and strong blade that is required is deadly (many RC hobbyist actually got killed by the blade of their RC helicopter). It is due to their high rotation speed , mass and sturdiness (they can't brake). On the opposite multicopters are turning much lighter smaller blades that break easily upon impact. If you're comparing a 700 class heli with a DJI Phantom then ok, fair point, however, if you're comparing a similarly capable quadcopter (Capible of 10kg of payload) the risk is actually considerably higher for the multirotor. For a quadcopter to handle this you would need 25+ inch blades and would weigh 20+ kg, if there is a failure of a power-system in a quadcopter it instantly falls out of the sky at free-fall and will crush anything below it. With a Helicopter, you have the chance of auto-rotating down safely and so long as you still have servo control, even without servo control, due to the disk still spinning, many times it comes down much slower than free fall like a large multirotor. After working with large quadcopters and helicopters for UAS for the last 2 years, I have seen much much more failures and issues with large quads than I have with heli's (ESC sync issues, lack of stability, lack of response time when turning large props, etc). For small applications like a small camera in the sky, multi's are great, for any real work that needs efficient long flight times and heavy payloads, a helicopter is far superior, including for safety. @Jason, you are mixing the functionality argument with which I agree helicopters are more efficient , and the safety argument for which helicopter blade contains much more energy (due to: engine torque, blade mass, rotation speed, blade material made to resist impacts) than a single blade in a multi rotor. Further, history shows nobody ever died from a multi rotor blade impact while lots of death cases happened with helicopters. These are facts, not an opinion. You're not comparing apples with apples. As I stated, A large quadcopter falling out of the sky at freefall can easily kill someone. I'm not talking about being hit by the blade, i'm talking about a 20kg object falling from 100 meters. A DJI Phantom won't kill someone because i'ts small and light, but, the helicopters that have killed people are 6kg 700 class helicopters. This is not a similar comparison. I don't think anyone's been killed by a 450 class helicopter which is more comparable to typical quadcopters being flown around. Arguably a blade strike from a Single rotor helicopter may cause more damage than a similarly sized quadcopters propeller blade. Although the vast majority of multicopter blades are one piece and also tightly affixed to the mass of the motor armature with resulting full transfer of all that mass into any blade strike, most helis actually have free pivoting blades thus only transferring the mass and inertia of a single rotor blade into the object being struck. This can easily be less than the equivalent of one multicopter propeller armature mass. Also, many multicopters have razor sharp carbon fiber blades, often heli blades are not nearly so sharp. As for performance, as you scale up the aerodynamics of multicopters worsen rapidly, a quadcopter with 25" propellers is near the upper limit of what can be controlled with a fixed pitch propeller, especially under windy or gusty conditions. Also, large multis handle very ponderously and do not respond quickly. This is not the case for helis, at any size, that variable pitch rotor lets them maneuver like lighting. Yes some really big ultra high performance helis have managed to kill a few people, generally being flown at their maximum 3D limits and without adequate safety precautions. And if similarly sized high performance multis were being flown that way they would pretty much represent the same threat. And Chris, you miss the point, the control issues on a big fixed pitch single propeller craft are not soluble, as a matter of fact the bigger you make a fixed pitch propeller for vertical lift the harder to control it it becomes. This whole community has already been there and done that and the single copter or even coaxcopter have very marginal control under the best circumstances and they have very low performance and lack of control under all but the most optimal conditions. This is a simple result of this design, they don't work well at any size and work worse the larger you make them. It is possible some sort of surface effect design like Coanada can be made to work - sort of, but I greatly suspect it would be very low performance and severely lacking in controlability under sub optimal conditions as well. Take a look at the singlecopter and coaxcopter page on my Multicopters are fun Web site. I first authored this for the ArduPilot Wiki. You can make one that flies indoors, but they really are so sub optimal they aren't useful for much more than being a toy.